High quality wedding and formal event invitations produced by Carlson Craft. Letterpress, foil stamping and thermography printing available for personal or professional stationary uses. 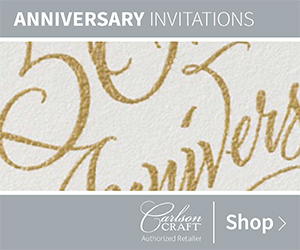 Carlson Craft is the most well-known provider of wedding & social stationery in the nation. As a certified dealer, I offer guidance through the ordering process. As a designer, I offer a custom look to call your own. The following options are available to ship normally within 7-10 days of placement. Click a box below and customize your invitation online for free. Once complete, you will be given the retail price and, depending upon the scope of work, I can often undercut this total. For a complimentary quote or to request a consultation, please email me at luke@rustydogstudio.com or complete the form below. 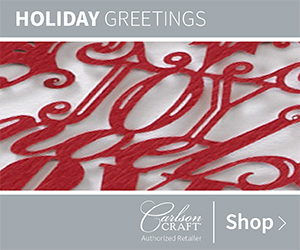 Available through Carlson Craft's Custom Print Services, the following papers, envelopes, finishes and imprints are available to customize. Available in multiple sizes, these unique print options can be used to produce event invitations and high-end marketing materials, such as letterpress business cards. Email me at luke@rustydogstudio.com or complete the form below to request a complimentary quote or personal consultation. 80# Pearl White 100% Cotton, 80# Fluorescent White 100% Cotton, 70# Black, 70# Claret, 70# Fuchsia, 80# Kraft, 80# Ecru Shimmer, 80# Ecru, 80# White Shimmer, 80# White. Printed return address on back flap and individual recipient addresses available, as well. Accentuate and transform your design with these trim options: Rounded, Crest, Ticket & Scallop. Custom trim available upon request. Laser-cutting machines use precise laser beams to burn a library of unique, intricate designs in the paper that add up to a work of art. Foil-stamped designs are crafted by applying colored foil to paper with the use of a die and the perfect combination of pressure and heat. Add depth to your design with letterpress typography and symbols. This age old printing method applies pressure and ink to the paper in order to create a relief imprint. Unlike the relief imprint achieved with foil stamping and letterpress, thermographic printing uses heat to raise the ink providing a tacky, textured feel. Thank you! I'll respond to your message within 23 hours.